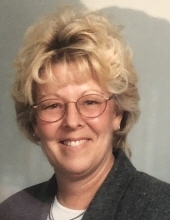 The memorial service for Karen L. Youngerman, 66, of Sioux Falls, SD, formerly of Aberdeen, SD, will be 10:00am, Thursday, April 18, 2019, at Spitzer-Miller Funeral Home, 1111 S. Main St., Aberdeen, with Pastor Derek Baum officiating. Karen died Wednesday, April 10, at her home in Sioux Falls. Karen Lee Youngerman was born September 28th, 1952 to John and Lieuvilla (Bradford) Youngerman at Aberdeen, SD. Karen grew up with three siblings: Jackie, Mike, and Carol. She spent her younger years growing up in Aberdeen, SD, attending Howard Hedger Elementary and graduating from Aberdeen Central High School, with the Class of 1970. She was married twice and is the loving mother of two sons: John and Joshua Tadlock. Karen has five grandchildren: Maisy, Lily, Avery, Nessa, and Jack, all of whom she loved very much. She spent the last years of her life in Sioux Falls, four of them working for St. Joseph Indian School, where she collected donations from the public. She had a love for motorcycles and animals. There was never a time in Karen’s life that she wasn’t caring for an animal, whether cats or dogs, even squirrels and one little blue jay. Karen will be remembered for her love of animals, love of life and a never-ending love of her boys and her family. Grateful for having shared Karen’s life are her two sons, John and Joshua Tadlock; grandchildren: Maisy, Lily, Avery, Nessa, and Jack; and siblings: Mike and Carol. Preceding Karen in death are her parents, John and Lieuvilla Youngerman; and sister Jacque. To send flowers or a remembrance gift to the family of Karen L. Youngerman, please visit our Tribute Store. "Email Address" would like to share the life celebration of Karen L. Youngerman. Click on the "link" to go to share a favorite memory or leave a condolence message for the family.